Cantina Captiva has excellent, authentic-ish Mexican food. The shrimp and fish tacos are great, the guacamole fresh, the frozen margaritas refreshing. Order a Chile Relleno and you will be full for days. With prices very reasonable for its tourist town location, CC is a must-go for lunch or dinner when you’re on Captiva. 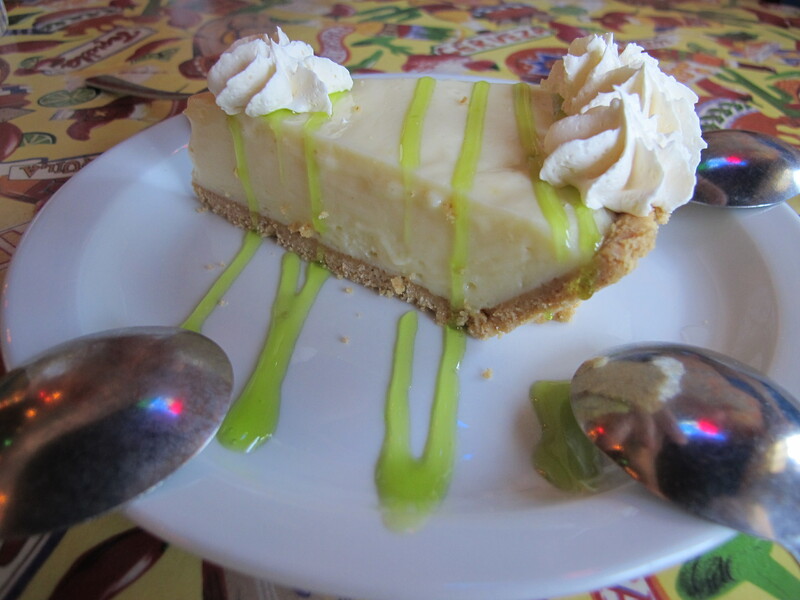 The key lime pie, however, is not the star of their show. Which is totally understandable if we are respecting the restaurant’s clear preference for authentic Mexican, but not ok in the eyes of this contest. The texture was excellent, but the filling was over-sweet and lacked acid, there was almost an absence of lime flavor. The crust was a good chewy/crunchy graham cracker base, and the whipped cream was fresh, but the drizzle on top seemed to be a bland sour apple. An extra 1/4 cup* of lime juice would make all the difference for this pie. Sunset Grill Doc Ford’s Bubble Rm Cantina C.
*Give or take a cup. I’m not much of a baker.